It has been a painful period for shipowners operating bulk carriers. Growth in dry bulk trade slowed sharply last year and seems to have almost halted, adversely affecting vessel demand. Despite decelerating fleet capacity expansion, freight market rates plummeted, with great advantages for charterers. Will the 2016 market trend be any less excruciating for owners? Some cautious optimism was expressed at the beginning of 2015. At that time growth in the world bulk carrier fleet was moderating, while global dry bulk trade seemed likely to continue growing at a healthy pace. Although these indicators are not always accurate guides to the balance between ship supply and demand, a possible move towards an improved freight market balance could be detected. Events did not unfold according to these expectations, unfortunately for shipowners. The bulk carrier fleet trend evolved broadly in accordance with predictions. The fleet growth slowdown foreseen was confirmed by clear signs of a lower annual newbuildings delivery total and higher scrapping. But instead of further moderate trade expansion assisting a market revival, it became progressively more obvious that the global trade growth rate was falling steeply. The result was, for much of 2015 and for all bulk carrier size groups, very low or even greatly depressed freight market rate levels, sometimes not even covering operating costs for economical ships. Currently, a better balance between the key drivers is still awaited; it remains difficult to predict the timing of a fundamental and sustainable improvement in the market pattern. An extended decelerating fleet growth trend continued in the past twelve months. The very fast bulk carrier capacity expansion seen in the years up to and including 2012, when annual percentages were in double digits, has moderated. Last year’s increase appears to have been under 3%, compared with a 4.4% rise in 2014. Figures compiled by Clarksons Research show that, at the end of 2014, the world bulk carrier fleet of vessels from 10,000dwt upwards amounted to 758 million deadweight tonnes, comprised of 10,400 ships. At the end of 2015 this fleet probably reached around 780m dwt, based on tentative figures for newbuilding deliveries and scrapping. 50m dwt, new bulk carriers delivered in 2015 were roughly 4% higher. But demolition sales for scrapping rose strongly, exceeding 28m dwt, a jump of over 75% from the preceding year. Consequently net deadweight capacity (newbuildings minus scrapping) added to the fleet last year was much smaller, reducing the growth rate. Among the main bulk carrier size groups — Capesize, Panamax, Handymax and Handysize — some remarkable fleet growth contrasts were seen over the past year. In the Capesize vessels segment (100,000dwt and larger), expansion almost ceased, with a marginal 0.5% estimated rise. By contrast, in the Handymax (40–65,000dwt) group, growth accelerated to a rapid rate of around 8%. In the Panamax (65–100,000dwt) and Handysize (10–40,000dwt) categories, restrained 2–2.5% expansion occurred. What is not always so clear is how these deadweight growth figures translate into changes in actual transportation capacity available. Increases or decreases in capacity to move cargoes, within any period, depend greatly on how productively ships are employed. Factors such as ship speed, ballast voyage patterns, and duration of port visits including any delays, are crucial when calculating the supply of transport services. This statistical data is hard to obtain and usually not comprehensive. Slow-steaming, an operating speed lower than ‘normal’ progress at sea, continued to be a feature of bulk carrier employment last year. Greatly reduced bunker fuel costs eased the pressure to proceed at the most economical speed. But low freight rates and charter revenues, depressing and often eliminating profits, resulted in continuation of slow-steaming which, by lengthening voyage duration, effectively removes a significant amount of transport capacity in any given time period. Global seaborne dry bulk commodity trade’s advance slowed markedly in the past twelve months, based on provisional calculations. Growth may have ceased altogether. 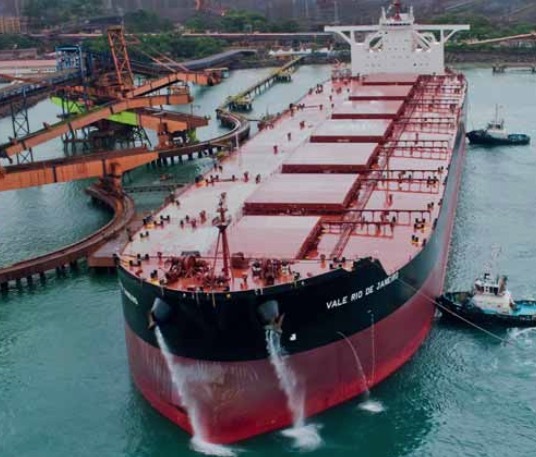 A separate article (‘Dry bulk trade confronted by strong headwinds,’ starting on p5 of this issue of Dry Cargo International) provides more detail, so only a brief overview is included here. In 2015 the upwards world dry bulk trade trend apparently decelerated to a sluggish increase, or may have completely stalled. Consequently the annual total volume probably was similar to the 4,700mt (million tonnes) recorded in the previous year. Annual growth remained remarkably strong over a period of five years through 2014, so the weakness now visible is a very recent feature. During 2014, while weakness was evident in some of the minor bulk trades, the three majors — iron ore, coal and grain/soya — together grew rapidly, supporting overall robust dry bulk trade enlargement. That pattern changed noticeably in 2015. Minor bulks picked up a little, but iron ore movements ceased expanding rapidly and grain trade growth faltered. Coal trade actually shrank last year, with what appears to have been a sizeable fall of about 4–5%, after many years of uninterrupted expansion at varying rates. Changes in the pace of China’s imports have been a common factor heavily influencing global movements in most commodity trades. The massive increase of 120mt in iron ore imports into China in 2014 comprised around 55% of that year’s entire increase in all world dry bulk trade. In 2015 an estimated 70mt fall in China’s coal imports apparently offset all or most growth in other dry bulk trade movements. Trade volume changes are a useful indicator of demand for ships’ transportation capacity, but are not necessarily an accurate one. Another factor, as is well known, greatly determines the deadweight capacity required: transport distance. For example, when voyage distances carrying cargo lengthen and therefore take longer in time to complete (assuming unchanged speed), demand for shipping capacity rises even when there is no change in the commodity volume being transported. The tonne-mile unit reflects both influences, but statistics compiled on this basis involve complex calculations and assumptions and are not (usually) readily available or up-to-date. So cargo volumes shipped are still often the most useful guide. Comparing annual deadweight capacity growth in the bulk carrier fleet with annual growth in the volume of dry bulk cargo moved provides a partial explanation, and sometimes most of the explanation, for changes in freight market rates. When these indicators are compared for 2015, a deterioration in the market supply/demand balance is clearly emphasized. Substantial surplus capacity, principally due to excessive fleet growth (compared with trade volume expansion) has been a feature of the bulk carrier market for many years, reflected in the subdued freight market. In 2015 the balance was affected adversely by a fleet growing by around 3%, while trade was flat or only minimally increasing. Many other influences, in addition to these ‘underlying’ fundamentals, are instrumental in driving short-term freight rate changes. cargo flows. On a behavioural level, market sentiment and expectations as well as derivatives trading also contribute to short term fluctuations in physical market rates. The Baltic Dry Index (BDI) reflects these changes. This index, compiled by the Baltic Exchange, is based on current bulk carrier freight rates (mostly time charter hire rates) for a wide variety of ship sizes and employments. It therefore can be regarded as a useful very broad indicator for the entire bulk carrier market. After beginning 2015 at a low 771 points, the BDI declined further to just over 500 in mid-February. Following a slight pick up, the index stayed mainly within a depressed 550–600 range for three months from early March to early June. The next two months saw a doubling, which peaked at 1,222 in early August, but then a downtrend started. The decline continued for the remainder of 2015, with a couple of short rallies, and by late December the BDI was at 475, near an all-time low point of 471 reached a week earlier. Overall, it was a very weak year for the bulk carrier freight market. As the new year begins, are there any signs of a change in the bulk carrier market’s trajectory resulting in higher freight rates? A pickup in trade volume growth would assist, especially if coupled with additional steps towards bringing fleet enlargement down further. But how likely are such events? Despite last year’s unexpected rapid reduction of global seaborne dry bulk trade growth, arguably a second consecutive year with a similar outcome is not inevitable. Much depends upon China’s commodity imports, especially coal and iron ore. These are now seen as key uncertainties, with both the direction and magnitude of changes, possibly large, becoming more difficult to forecast. If these commodities continue to plummet (coal), or cease expanding (iron ore), it will be harder for global trade to evolve positively. An optimistic view might suggest that world dry bulk trade could see 1–2% expansion, or possibly more, in 2016. Bulk carrier fleet growth seemingly is heading for a growth rate of at least 3% this year. Given the extent of the newbuilding deliveries schedule for 2016, exceeding last year’s scheduled figure, actual deadweight deliveries may be larger unless delays and postponements increase. Nevertheless, it is now perhaps looking more likely that scrapping will remain high, possibly reaching or attaining the volume seen in the past twelve months, and preventing any substantial acceleration in fleet expansion. Shipowners’ collective decisions affecting bulk carrier fleet carrying capacity have a more certain impact than a focus on waiting for trade expansion, over which the shipping industry has only quite limited influence. During the year ahead, a combination of accelerated scrapping, newbuilding delivery postponements (or cancellation of orders/conversion to other vessel types, although this action applies mainly to orders for later delivery) and possibly laying-up ships, could greatly alter market dynamics. Changes in other influences will affect the result. For example, even a small change such as half a knot in the average speed of the entire world fleet would have a sizeable impact on carrying capacity over a whole year. Trading distance and port congestion variations are other visible factors affecting capacity available. Neither is easy to predict. But the foregoing broad indications of trade and fleet evolution point to limited scope for an upwards trend in bulk carrier market rates to persist through the next twelve months.